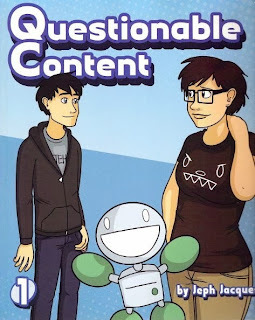 Despite it having started back in 2003, I only started reading Questionable Content sometime last year. I seem to recall having seen it a couple years before but, for whatever reason, I didn't get into it at the time. But having started reading it regularly in the middle of last year, I quickly found it to be a regular favorite. Creator Jeph Jacques is really consistent with his writing style, and turns in clever dialogue day in and day out. Not to mention that I really like his illustration style. But despite having nearly a decade's worth of material available for free online, I opted to purchase the three compilation books he has available. Part of it was to provide some monetary thank you back to Jacques for my enjoyment of the series, but part of it was that I like the long-form reading experience better in print than online. I've been noodling that idea while going through all three of Jeph Jacques' books and I think I finally pegged why I have that preference. The problem with #1 is that my memory is not infallible in the first place, and I have no clue how long it might be before I'll get a chance to return to the strip's archives. Also, as I'm reading a story, I tend to get engrossed in the story and completely miss that there are date-stamps on the individual strips that I need to pay attention to. Both #2 and #3 solve the memory issue, but have some issues of their own. With #2, I'm limited to following the comic on one specific browser on one specific machine. However, I switch between two desktops, a laptop and my phone with great regularity, and I have another three or four machines I use not infrequently. Tying my archive strip reading to only one of those would be decidedy inefficient. Option #3 is the most viable, but I've not been terribly happy with the user experience in these solutions. I understand that they're essentially trying to create a navigation overlay for an existing set of webcomics which have their own internal and independent navigation, so that it works at all is pretty impressive. However, I still find the process overly cumbersome and somewhat intrusive to the reading experience. In fact, I find that Option #3 to be so cumbersome that I would prefer to pay for a printed copy of the book or, if one is not available, simply not read the archives at all! In the Questionable Content example, the books Jacques has printed so far only cover about one third of the archives. So I've got this huge gap between what I've read in the archives and what I'm reading as current. Apparently Marten and Dora broke up at some point, and Faye and Angus have some kind of hook up after all, and who the heck is Steve dating now, and Dora seems to be going out with Tai now? But I'm willing to let those questions all kind of hang out there because going through the online archives is too tedious compared to just reading a physical book and throwing in any handy scrap of paper as a bookmark when I need to set it down for a bit. 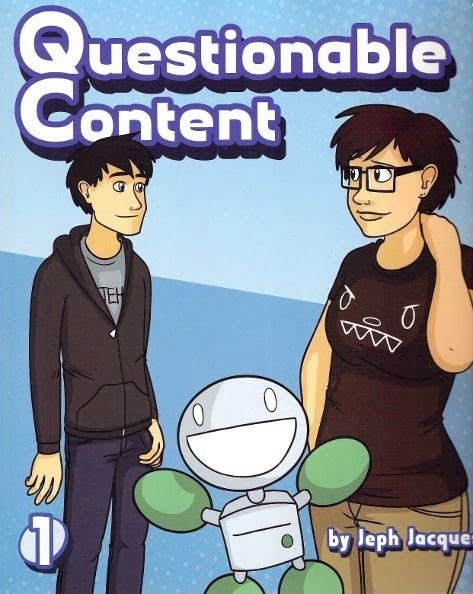 So it seems to me that having print edition of your webcomics available -- even if they're just a-little-better-than-break-even-PODs -- is something of a necessity to keep your audience engaged for a longer term. After all, the more they read your comic, they more emotionally invested they're likely to be. The more emotionally invested they are, they more likely they are to continue reading. This is kind of how the Marvel and DC business models work, after all! Not to mention that by having printed books available, you have more to sell both online and at conventions. This is me talking here though. I'm a sample size of one. I don't know how many other people, if there even are any, have the same type of reading habits and experiences I have. But I'm sitting here scratching my head and wondering why any webcomic creator who has a book's worth of material doesn't have printed copies available for purchase for those of us who are late to the party that is their webcomic.